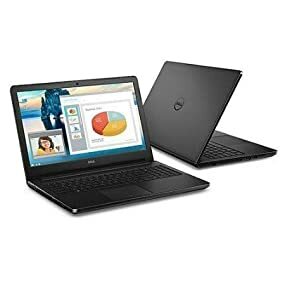 The new-gen Dell Inspiron 15-3567 laptop is the ideal lightweight laptop for on the go professionals. The long battery life, anti-glare backlit display lets you use the laptop even in non-ideal lighting conditions. It features a 6th generation Intel 1# processor for faster processing speeds. The Dell Inspiron 15-3567comes with numerous easy access ports for attaching your various accessories and gadgets. This laptop is light weight with a large display. Don’t let the 15.6 inch screen fool you into thinking this is a heavy and bulky laptop. It measures 49.2 x 35.6 x 8.4 cm and comfortably fits in most office bags. It weighs 3.2 kilograms. Ideal size and weight without compromise on the screen size. 1. Processor – 6th Generation Intel core i3- 6006U processor (3M cache, up to 2.30GHz). 2. OS – Windows 10. 3. RAM – 4GB single channel DDR4 2400MHz (4GBx1). 5. In-built graphics card – Intel HD graphics 520. 6. Dispaly – 15.6-inch HD (1366×768) anti-glare LED-backlit display. 7. Hard Drive – 1TB 5400RPM SATA hard drive. 8. DVD reader/writer – Built-in 9.5 mm SATA tray load 8X DVD+/-RW. 9. Chipset – TPM 2.0 (Optional software or hardware). 10. Wireless – Integrated wired|gigabit ethernet network, wireless LAN.